This event is simply for #SBS winners only and boy oh boy was it a great event. Despite my trepidation at attending, everyone was so friendly. There was no need to stand on ceremony announcing who you were and where you came from either. For two days I was walking on air mingling with fellow #SBS winners. I was recognised by many of those attending because I had virtually networked tirelessly since our win on 16th March 2014. It was truly a wonderful feeling when I kept hearing ‘there’s Chrissie’ . So many people came over to say thanks for the support I had given to them via tweets etc. I took 100 goody bags with me and during the event I was able to distribute 80 of these. I even came away with 45 contacts too. Theo Paphitis, CEO of Rymans Stationery, Boux Avenue and Robert Dyas, and Dragon’s Den fame shared his story of SBS (Small Business Sunday). Back in October 2010 he was sitting in his kitchen one Sunday evening and came across something called ‘Twitter’. Theo soon discovered and realised, the potential of this excellent tool for businesses to market themselves, but most importantly to strike up conversations with other businesses too, as well as being seen by thousands with relative ease. He tweeted that the first 6 small businesses to tweet him would get a retweet from him. Little did he realise that he was helping to give exposure to these 6 through his thousands of followers. However, what he did not expect was 100’s of tweets to flood in. The following Sunday people were actually tweeting him and asking him to retweet them too, and this is when SBS was born! Businesses now send him ONE tweet every Sunday between 5:00pm – 7:30pm about their business and the following Monday evening at 8pm he chooses his 6 winners himself and retweets them. Theo is such a humbling man always remembering his roots and he has such an aura around him that makes everyone feel so at ease and equal too. There has been an event (free) since 2011 which is designed to bring fellow SBS winners together. I was told by fellow SBS winners that there has always been something new to share with the SBS family at each of these events. This year was no exception as 2016 has the introduction to the SBS shop which is going to be an exclusive website to showcase winner’s products and services. Theo spoke about being passionate about your business and emphasised to let that passion shine through by telling YOUR story as there is no one like you! After lunch there was a Q & A panel with Holly Tucker, one half of the creators of Not On the High Street.com, Mike Pickles from The Really Useful Box Company and Theo Paphitis too. This section was most informative and questions were invited from those that were brave enough to ask. Something which Theo advocated especially after the power of ‘that’ tweet on that Sunday evening sat in his kitchen back in October 2010! (2) Treat a complaint as a gift! Theo stood on stage and confessed to being a YouTube junkie. He felt that Video was very powerful in a Customer’s potential purchase. He pointed out that Video is great for showing who you are, and what you do, as well as how you can help a client. We all know that the world is changing, technology is constantly changing and it was reiterated to keep on top of it as well as keeping your business current too. What works today for example may not work tomorrow. It was pointed out that a few years back everyone was talking about the High Streets ‘dying’ due to online shopping then suddenly out of the blue came ‘Click and Collect’. People wanted the option to shop online, but still going to store to collect it rather than wait hours for it to be delivered. Make it easy for interested clients to see what you do and how much it costs, but most importantly how they can get that service. Don’t over complicate your business. One of Theo’s suggestions was to strip your company back to who you are and what you do. Whatever you need to do make your business run smoother, then simply do it! 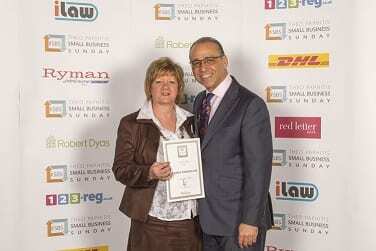 For all new #SBS winners and those who had not previously attended an event, there was the opportunity to have a photo with the great man himself, Theo Paphitis. The highlight of my day was being able to collect my Certificate and have a photo with Theo. The end of the event concluded with ‘goody bags’ filled with small gifts from all Sponsors. During my time at the #SBS event I met some wonderful winners and even one of the very first winners of 2010 too. They had not had the opportunity to attend any previous events. Listening to everyone’s story was fabulous. We all bid each other goodbye, adding that we were all looking forward to the next event. 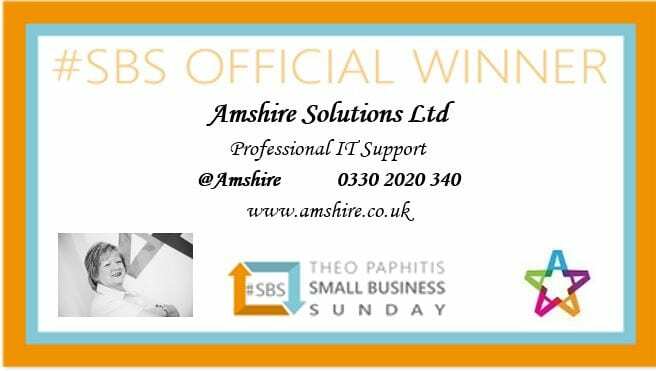 Anyone looking for a re‐tweet from Theo should tweet him about their business on Sunday between 5:00pm and 7.30pm and include the hashtag #SBS. Every Monday at 8:00pm Theo chooses 6 lucky businesses and retweets them. #SBS winners are invited to add their profile on his website free of charge.